JF585Y is used in cleaning-drying-soaking glue-drying (solidifying) brake shoes of automobile before them being stuck and riveted. l Continue working, work-pieces are hung up on the convey chain until finishing the whole course and then taken away. The work-pieces have two take away positions: one is for sticking shoes and another is for the riveting shoes. l Super-sound wave cleaning, add a further cleaning work position to make sure the pieces are more clearly. l The work-pieces are glued in soaking way, so it makes any corners of pieces be hung glue. 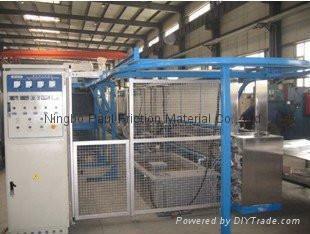 l Drying (solidifying) temperature can be preset as you like and auto controlling temperature. A pneumatic pump is used for cycling the glue so the glue will be more evenly, safely and reliably. from 300~ 600 to 600~1200 pieces/h.